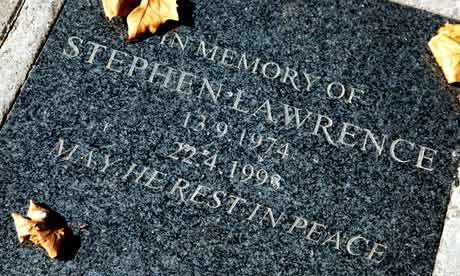 It is hard believe that it will be 20 years this week since the death of Stephen Lawrence. Twenty years since that young life of promise and hope was senselessly snuffed out like a candle. But when confronted by such a high profile case - one would like to think that he had not died in vain and that lives of such promise would be allowed to flourish and grow into fullness in our day. But no - 20 years on I could read you a litany of senseless slaying. The lessons learned from such a murder are not that they should not happen and that society changes for the better, but rather that death can be brutal, it is certainly final and it often utterly crushes those left behind. And it’s not just in the UK, but in the US since Columbine - many a young life has become a half life of unfulfilled dreams whether in Aurora, or recently in Sandy Hook, or in Boston, or in West in Texas. But not all death is high profile whether by famine, genocide or tsunami. The impact on a home, a family, a community, a street, a school, a work-place is no less significant. Death in Afghanistan is not somehow death magnified. Death is not nothing at all - it’s the ultimate something. Tabitha died. She’d been ill and died. She was mourned by those whom she loved and by those who she gave of herself to. Her death, like all deaths, to them was the ultimate something. Her name means ‘gazelle.‘ They are beautiful creatures. She may have been physically beautiful but her love and care for the lowest in society - namely widows - was certainly beautiful. She had a beautiful home. Joppa, the city where she lived may well mean ‘beautiful’. It was a majestic place built on the shores of the Mediterraean about 40 miles NW of Jerusalem, modern day Tel Aviv. Joppa was beautiful because, unnoticed to many perhaps, Tabitha was alive there. Tabitha was beautiful because she was was alive and she loved. We know nothing about a husband or partner, but she is called a disciple - God had whispered to her that she was loved and she heard and believed. She may have been a convert of Philip’s who had preached & taught around that region but she became part of a community where the social order of the day was turned on it’s head - where fishermen preached, where the paralyzed are standing and changing lives and where this beautiful woman cared for the poor of her city. And to them her death was the ultimate something. In Tabitha, God was outworking the topsy-turvey values of the Kingdom where the lowly poor are raised up - cared for, protected and loved. The widows were on society’s bottom rung - no husband meant no income, no security, no safety, no food. These are the ones Tabitha has devoted her life to caring for and as she dies, her work dies, which causes a crisis in the community, so Peter is called for. As Peter arrives he’s taken upstairs to where Tabitha lies - to confront the ultimate something. The garments that the widows show demonstrate Tabitha’s abilities with a needle and thread as a seamstress, but they also show the golden thread of the love of God weaving Tabitha and the lives of these together with the life, death and resurrection of Jesus. We do not know Peter’s motivation for doing what he did next - either way, through it, God demonstrates that whilst the church He calls to life inverts the natural order of power and status, it is a place where even life itself is inverted and death, whilst the ultimate something, is a gateway to life. Peter called the assembled to show that Tabitha was alive. But God had called her first. He had already called her by name and loved her and in being loved she loved others especially the unloved with the love of God Himself. Even in death Tabitha truly lived. God loved Tabitha so much. He loved her so much that He raised her to life, not when Peter prayed or commanded, but when Jesus brought the glory of heaven to live and die and rise amongst the ordinary, amongst the widows, the poor - all those whom life kicks in the face - and to share that glory, that life with us. She was called Tabitha, but she was called by God, and she was called to life by God but the life she was called to, was the life of God in His Kingdom - where the mighty are brought down, the proud are scattered and the lowly poor are treated with ultimate respect and care. Tabitha’s death would have been one of billions not splashed across the headlines of history had it not been that she was living again. Even after being raised from the dead and Peter showed her to be alive - God had already demonstrated that love and life in it’s fullness because of the resurrection of Jesus was at work in and through her - and the poor saw and felt it. Today is Vocations Sunday and today many a sermon will rightly be preached asking us to prayerfully to consider whether any of us are called to the Priesthood or to serve the church and community as a Lay Reader. Tabitha reminds us of what many of us will have heard or will hear from the Bishop in the Confirmation service “God calls you by name and makes you his own” - that calling begins long before we are ready to stand and make an adult commitment to our faith... From the very beginning the God who searches and knows us has a particular work for us to do. Whatever else He calls us to, each one of us is called by name in love and we are called to love others in turn, especially the unloved, with the love of God Himself that scatters the proud, that brings down the mighty, that raises the poor - a love that is seen and heard and felt, just as Tabitha did. Amen.